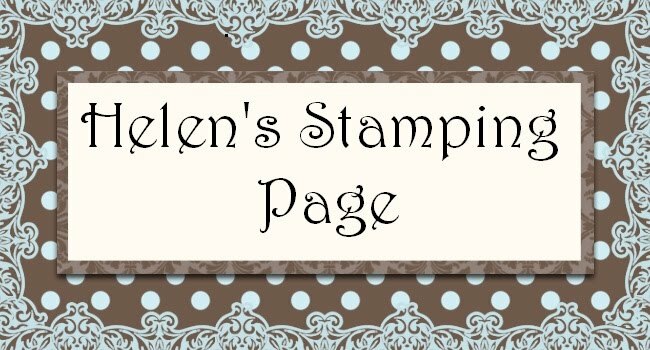 The card for today's post is using the Simply Said stamp set. The little flowers are stamped using Basic Black ink on whisper white and the flowers are coloured in using a bashful blue marker. The larger flower is stamped 3 times with Certainly Celery ink on whisper white and cut out. I have set silver eyelets using my cropodile. The flowers are set on So Saffron punched out with the medium circle punch. The "thank you" has been stamped with Bashful blue and punched out using the small oval punch and then adhered with dimensional's to the larger So Saffron card, punched with the large oval punch. 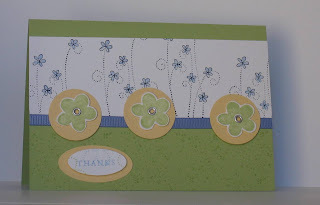 The bottom of the card is stamped with the tiny dots from Itty Bitty background stamp using certainly celery ink.